Providing employer group customers an easy-to-use analytical platform is one of the key ways health plans can demonstrate value and improve retention. Through this interactive employer reporting platform, health plans, brokers and employers can share performance metrics and make rational, data-driven decisions about benefit design, communication needs and wellness initiatives. 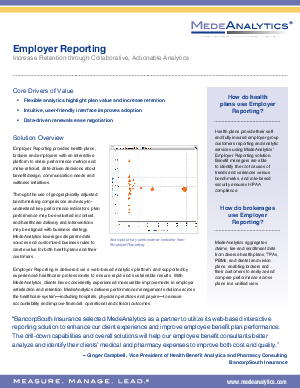 Read to find out more about how Employer Reporting can help health plans and their customers.